My gold flake foil finally arrived last week and I have just been dying to use it! 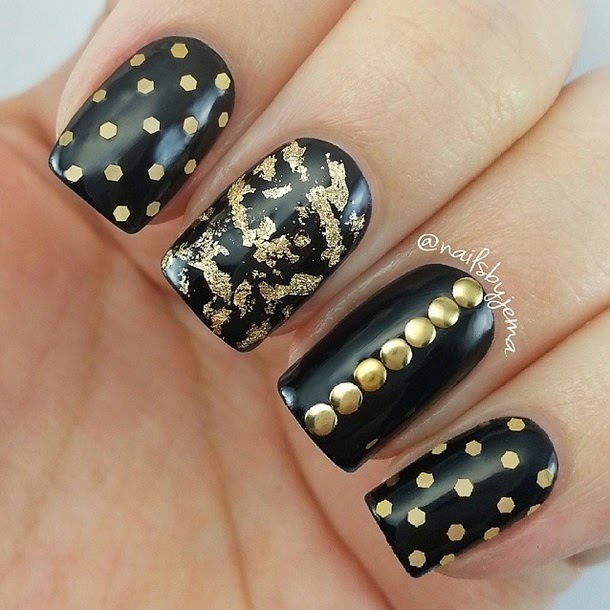 Last night I grabbed it and decided to create a black and gold mani! I kinda love black and gold together and on my nails I think it really works. Black is my favorite colour and I love dark nails so I usually end up always loving my nails when I do them dark. I used studs and glitter off eBay to do the other nails and I think its PERFECT! Glitter placement is my favorite thing to do at the moment and I can thank @sinney on instagram for that amazing idea. I wish I had thought of it but it is ALL her! Don't you think it's a perfect look?